Left: 5 x 7 inch scrap (approx.) of antique white Folio (which is a bit yellowish). The first card I worked on was just names that I wrote down and wanted to look up—details of wars and such. 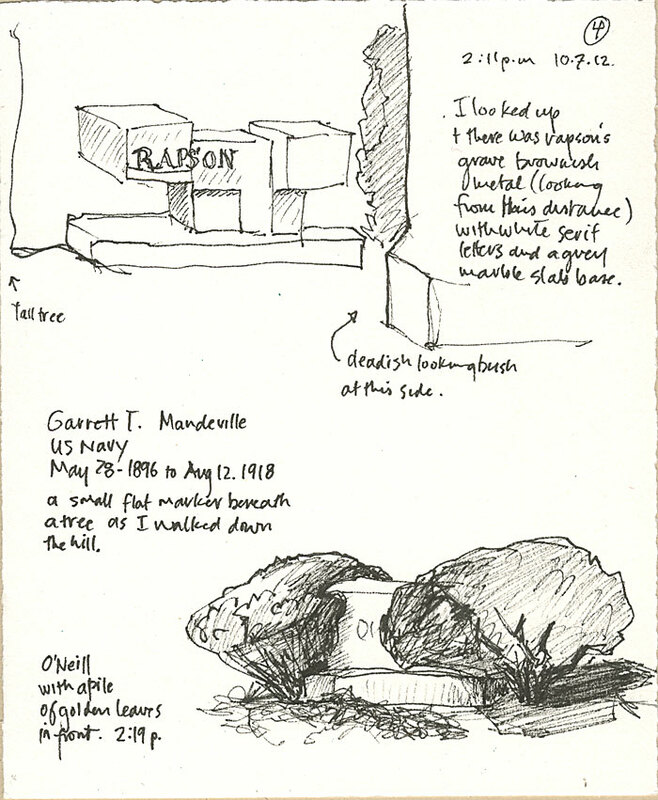 I wasn't sure I was going to sketch on the cards I was just walking up the hill and then I saw it….Click on the image to view an enlargement. 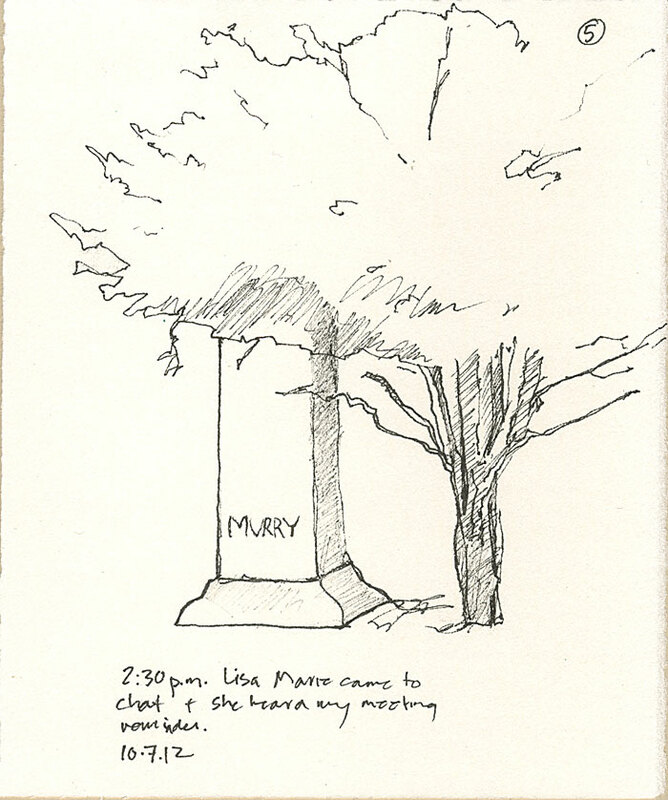 The first Sunday in October was a MetroSketchers trip to Lakewood Cemetery in Minneapolis. Since one of the coordinators who usually takes photos couldn't attend I volunteered to take photos of everyone's work at the end of the day—and then put all that up on the group's Facebook page (or album, or whatever FB calls it, I'm still upset with the album labeling and captioning process so don't get me started). While everyone got to see my large warm up sketches on 11 x 14 inch paper and my small sketches in the group photo posted on Facebook, I only have just been able to find time to scan these small sketches so people can see them close up. Right: Two more grave stones being hugged by adjacent shrubbery. Click on the image to view an enlargement. 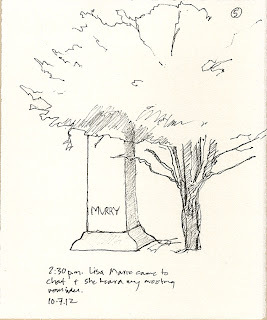 So here's what happened on the day: We all showed up at the mausoleum at noon to say hi. By 12:20 most of us went off on our own or in groups to sketch. I drove around a little and found a couple nice spots to get out and sketch. I had my big pad and thought I'd work big, but I found that a 14-hour day of teaching bookbinding the day before had left me a little wrung out with a very shaky hand, so drawing big seemed to accentuate the "tremor." I persevered for a couple pages but by the end of the second sheet I realized I wasn't looking at the large vistas. Instead I was focusing on things like the small sparrow on the bright green tap and the mound of small hard turds I found beneath a tree (possibly raccoon?). (You can take the tracker out of the field but she's still going to track.) I also did one large sheet of gesture drawings of the Elk sculpture at the burial spot for members of the Benevolent and Protective Order of Elks—it's a wonderful Art Deco style bronze. You can view my warm up sketches from the cemetery outing on my blog Roz Wound Up. Left: I ran out of bits of Folio and had some Fabriano 140 lb. watercolor paper torn to the same size. I decided to work on it next. 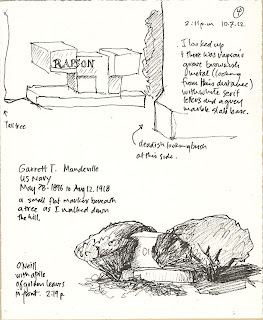 I began walking up a hill and turned to the right and there I saw Ralph Rapson's grave marker—recognizable anywhere. Click on the image to view an enlargement. I decided to give in and go small. I whipped out some small sheets of Folio paper that I had in my bag and started sketching only with the Staedtler Pigment liner .3. 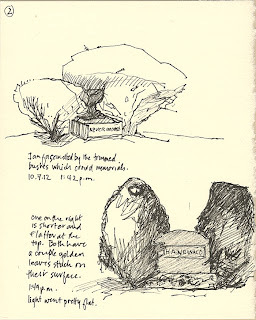 I saw a gravestone that was huddled between two exquisitely trimmed shrubs and couldn't take my eyes away. Then I turned my head and saw another such pairing. It seemed to me that the shrubs were actually hugging the gravestones. I started actively looking for more of these, at angles that captured the attractive sculpting of the shrubs. I had a theme. I ran with it for the rest of the day. Towards the end of our time a friend wandered up to me. We chatted for a few moments. "You're buzzing," she said. I realized my watch alarm, set so that I could get back to the wrap up meeting in time to take photos, had just gone off. It was a new watch and I didn't realize the unfamiliar tone was coming from my wrist, buried beneath a couple layers of clothing and a jacket sleeve (it was a cool day, though sunny). Off we went to the meeting. Left: My final sketch card on the day—also Fabriano watercolor paper. I didn't have time to shade in the tree that was covering this marker. It was time to go to the wrap-up meeting. (I was fascinated by the tree trunk's many bendings and twistings. I would have liked to work more on that.) Click on the image to view an enlargement. I had so much fun working on this series that I actually think my next journal will be one of the Folio journals I made and have waiting on a shelf. I've even priced the paper for a class I'm teaching next year on journaling and working with inks. If you are on Facebook I recommend you visit the MetroSketchers group and see the fabulous sketches that everyone made on that day. We were fortunate to have the fabulous Don Colley visiting. 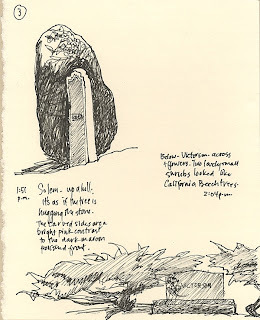 You can see the stunning landscape view Don made on the day, looking out the window of the mausoleum across the cemetery, on his blog. 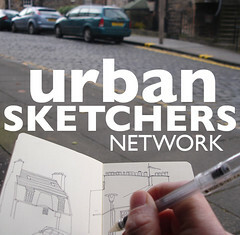 Get out and get some sketching done today. If you can go with sketching buddies great, if not, go anyway. If you go with sketching buddies, get "coffee"* afterwards and share what you all saw. Your own vision will be enhanced by seeing what caught the attention of your friends. *Yes "coffee" is code for chocolate cake.